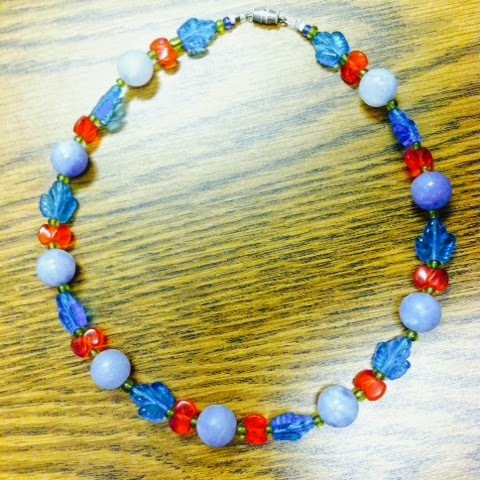 I had a vintage necklace fall apart, which is where the periwinkle blue round beads came from. The necklace was vintage from a thrift store. Instead of abandoning the beads to brokendom, I was all "slow fashion" even though no one had heard of that because it was 2008 and we were all just poor ebcause of the Recession. So I made a new necklace. The turquoise leafe beads, red round cornered rectangle beads and lime green spacer beads are all from the craft store. How on earth did I come up with this color pattern? They fell to the bottom of my craft bag! And I was like "I like this mix of bright and pastels." I wore them with other light blue accessories. It's how I pepped up one of my lovely Little Black Dresses in a mixed print plus size pin up style outfit. Get Your Green On: Here's Some St Patrick's Day "Looks" with a Retro Pin Up Flair I have a lovely green swing dress that I purchased from SammyDress.Com. It is a perfect dress for St Patrick's Day, if you want to get into the spirit of the day, but still have a retro pinup vibe to your outfit. Above, I'm wearing it with a petticoat underneath, a light green polkadot cardigan, a green belt and fairly flashy green accessories. I was heading up to Maine for a family friend's big 60th birthday bash/ St Patty's Party. The headband is a scarf that I bought at Dollar Tree. They have excellent holiday themed scarves, which you can use as your sole nod to the holiday in an outfit, or as an added accessory for a flashier look.